Sponsored content created and provided by Kevin Dill, senior nutritionist at Purina Animal Nutrition. Anyone who dairy farms knows raising calves is a big investment. Feed and labor costs are high, and it can take more than two years before a calf starts contributing to the bulk tank as a cow. Despite this, it still makes sense to invest in your calves up front. Feeding higher volumes of milk replacer and a program with quality starter and grower can deliver immediate and long-term results. Your future profits depend on your calves’ growth and development today. A diet of milk replacer, starter and grower that delivers the right amount of nutrients at every stage is essential for their performance as a calf, and their future productivity as a cow. Proper development, including weight gain, height, rumen papillae and mammary tissue, at the beginning of a calf’s life translate to more production as cows once they enter the milking herd. Research showed calves fed a full potential nutrition program through six months of age can achieve as much as 6,588 pounds more milk per cow through three lactations. For every 100 milking cows, the additional pounds of milk could lead to more than $98,000 in additional milk income over three lactations (at $15.00/cwt). The extra milk income can deliver a 5:1 return on your calf nutrition investment through three lactations. Capitalize on these results by providing a full potential milk replacer at a rate of 2.5 pounds of dry matter per calf per day for the first eight weeks of life with a free-choice 22 percent starter. Continue feeding starter ad-lib through 12 weeks of age. Then, transition calves to an 18 percent grower at a rate of 10 pounds per head per day with free-choice hay. Using a milk replacer, starter and grower designed to work together with similar ingredients can help establish feed preference to keep calves eating during diet transitions. Easier transitions help maximize intakes, improve growth and can help reduce age-at-first-calving by up to two months. However you crunch the numbers, investing in calf nutrition pays off. The gains you achieve today helps set them up for long-term performance. Contact your calf and heifer specialist to see the results for yourself. 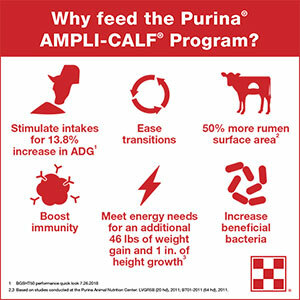 Learn More from Purina Animal Nutrition. Based on studies conducted at the Purina Animal Nutrition Center: LVGR5B (20 hd), 2011; BT01-2011 (64 hd), 2011. Based on studies conducted by Purina Animal Nutrition in collaboration with Iowa State University (DH6, calves born from January 2015 to July 2016). Growth calf program includes a 20:20 milk replacer at 1.5 lbs/head/day and a 18% CP starter, starting on TMR at 12 weeks of age. GSHT50 performance quick look 7.26.2018. Jorgensen, M., Progar, A.A., Godden, S., Chester-Jones, H., de Passille, A.M., Rushen, J., and Endres, M. University of Minnesota, St. Paul, Minn., University of Minnesota Southern Research Center, Waseca, Minn., University of British Columbia, Vancouver, BC, Canada. Risk factors for abnormal calf health scores on farms using automated feeders in the Midwest USA. American Dairy Science Association Annual Meeting 2015, #696. Sharon, K.P., Liang, Y.L, Burdick Sanchez, N.C., Carroll, J.A., Broadway, P.R., Ballou, M.A., Department of Animal and Food Science, Texas Tech University, Lubbock, TX, USDA-ARS, Livestock Issues Research Unit, Lubbock, TX, Pre weaning plane of nutrition and Mannheimia haemolytica dose influence metabolic responses to a combined bovine herpesvirus-1 and Mannheimia haemolytica challenge in post-weaned Holstein calves, American Dairy Science Association Annual Meeting 2015, #27. Comparison of calves reared using different nutritional programs on the same farm. 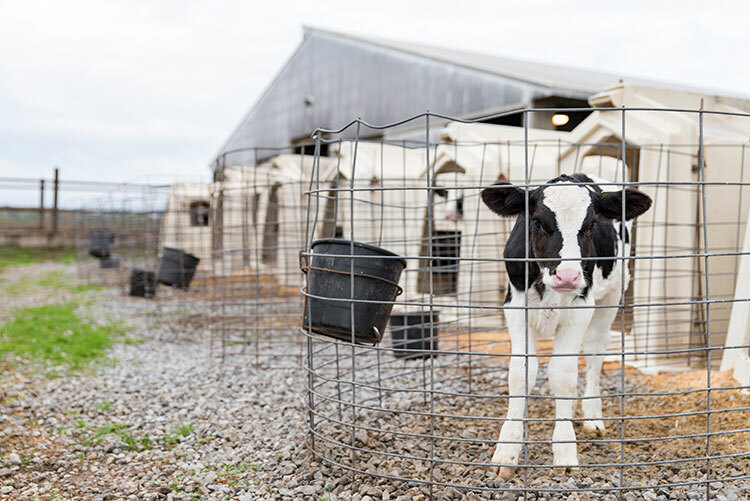 314,760 lactation observations and 344 animals studied at the Purina Animal Nutrition Center, born over a 5 year period from April 2007 to April 2012. Study DDM1 from 2017. Return on investment was calculated through third lactation and based on $15.00/cwt milk value. Study DDM 1 from 2017. Due to influences outside of Purina Animal Nutrition LLC’s control, results to be obtained, such as financial performance, animal condition, health or performance cannot be predicted or guaranteed by Purina Animal Nutrition LLC.